The reading was to take place in a rough-and-ready little theatre under a Waterloo railway arch. The title of the play was Short Memory, and we’d been told it was about dementia: it all sounded grimly virtuous. In the event we were drawn into a drama which was comic, studded with surprises, and full of pathos, as a variety of social, financial, and sexual themes were woven into an emotionally resonant tapestry. And the most unusual thing was this: the whole play sprang out of – and was framed by – a rehearsal of Handel’s Messiah, delivered by singers whom I happened to know: members of Highgate Choral Society, to which the play’s author Richard Roques belongs, as do I. This 220-member choir is one of the oldest in Britain, and evolved into its present form via the status of a humble local authority evening class. It’s very much a community choir, and depends on voluntary work by its members for everything from basic administration to the multifarious tasks involved in putting on concerts and organising tours abroad. 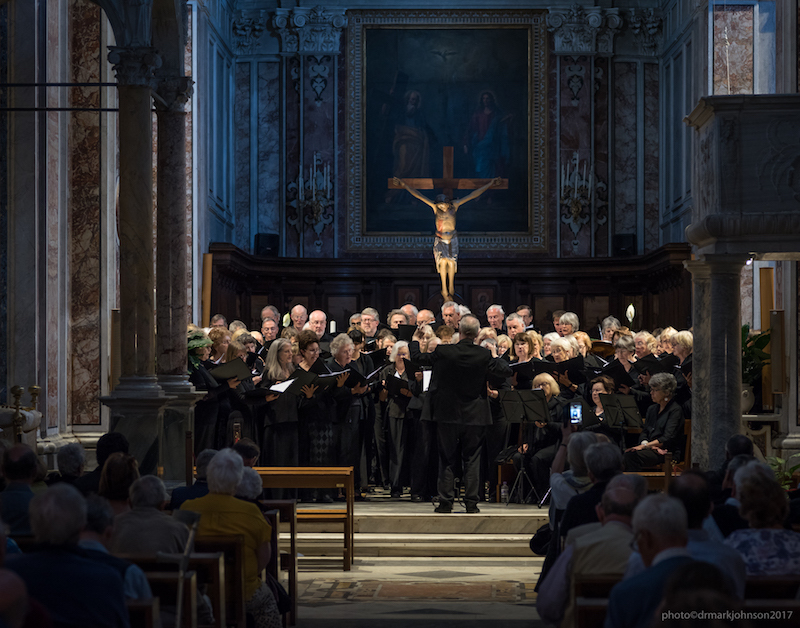 I joined it after a bereavement, and found its welcoming atmosphere – plus the thrill of joining my voice with others in Bach’s B minor Mass – the best therapy in the world. Asking my co—choristers what drew them to the choir, and what keeps them there, I find their replies drive at the same point from different angles, and go a long way towards explaining why choral singing is now so much in vogue. My baptism of fire with the Bach B minor came as a shock. I had assumed that my sight-reading skill and past singing experience – Monteverdi and Gesualdo, the Elizabethans, Stravinsky – would allow me to sail comfortably along, but this work was awesomely difficult, and conductor Ronald Corp, assisted by his keyboard wizard Alex Wells, was whipping us along at a ferocious pace. What unnerved me was that my colleagues were so forcefully on the ball. Then I noticed how dog-eared and much-pencilled their scores were: they’d travelled this road before. Actually, he is. In addition to running an orchestra plus three choirs – and also officiating as a non-stipendiary Anglican priest in Holborn – this remarkable man is ceaselessly composing, and his discography is now formidable. Many of his works are for voice and chamber accompaniment, with literary origins and a spiritual dimension as his particular hallmark; his passionately heart-on-sleeve oratorio And All the Trumpets Sounded is based on the Dies irae, Walt Whitman, and the English War Poets. His latest work, Letters from Lony, is a graceful chamber setting of letters sent by a Jewish lady from war-time Amsterdam – before her murder in Auschwitz – to her grand-child in Britain, a gentleman whose real-life wife now sings in the choir. The audience at its premiere at St Jude’s was moved to stunned silence by the unspeakable pathos of its conclusion. This musical community has deep roots, and its branches extend far and wide.